Do you remember the excitement of field trips in school? We want to share our excitement of a field trip we took last May to gain insights on making an accessible web. 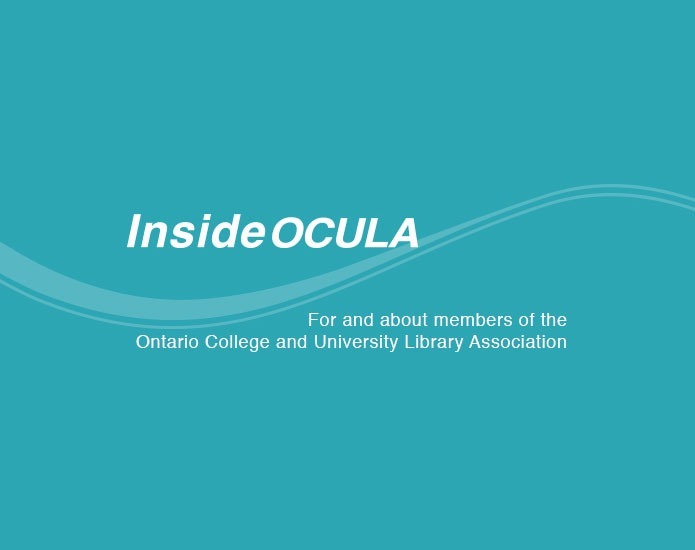 We are members of the Canadian Association of Professional Academic Librarians’ (CAPAL) Web Content Accessibility Guidelines (WCAG) community of practice. WCAG is an internationally recognized standard for creating web content that people with disabilities can use. Our community of practice meets monthly to discuss WCAG. We also do enrichment activities like asking people with disabilities (or their support team) about their experiences using the web, meeting with staff from the Centre for Equitable Library Access, and talking with researchers and practitioners at the Accessibility Conference. To give back to the public, we also hosted a public webinar for Global Accessibility Awareness Day where Gregg Vanderheiden, co-editor of WCAG 2.0, spoke about the Global Public Inclusive Infrastructure project, and the role of libraries in it. 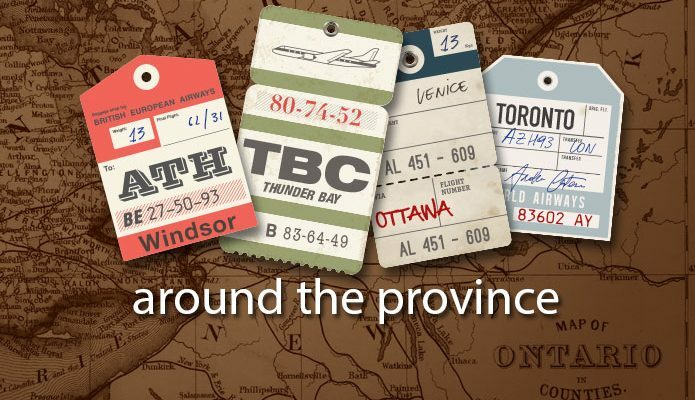 So buckle up as we tell you about a unique learning activity we did to learn about WCAG: a field trip around Toronto. WCAG’s fourth conformance requirement draws attention to web content being compatible with assistive technologies so we wanted to get a glimpse into the world of assistive technologies. So our first stop was Komodo OpenLab. At this innovative centre, a dedicated team develops Tecla, a technology that helps people with limited upper body mobility interact with their smartphones, laptops, tablets, and smart home devices. This gave us an insight into how people navigate the web using just one button. We realize that switches are one type of assistive technology and we look forward to learning about the range being used in our communities. After Komodo OpenLab, we hurried over to the OCAD Library Learning Zone for the Code4Lib North meet-up. 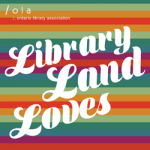 Code4Lib North is the Ontario/Canada chapter of Code4Lib, a community of information innovators working for or with libraries, archives, and museums on anything related to technology. 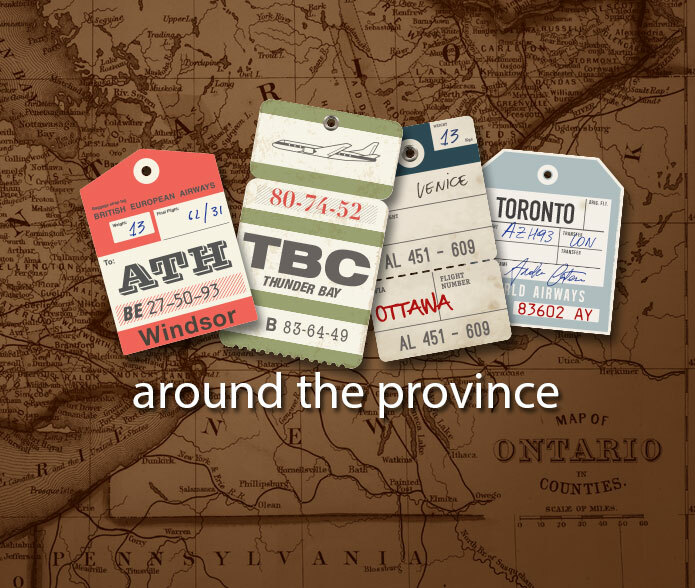 We joined our colleagues in time to learn about some of the inspiring projects being done around the province. 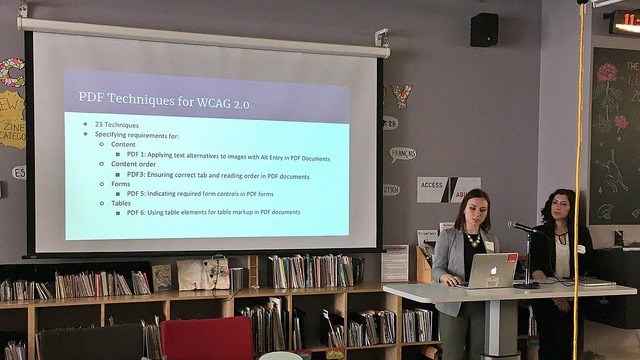 We were welcomed to share a presentation about our WCAG field trip, and our experiences creating accessible documents and designing mentorship-based accessibility training. Over lunch we talked with colleagues about their experiences with accessibility and WCAG. Sharing stories about accessibility with colleagues in the library reminded us of the vibrant exchange of ideas and stories that so often happens in libraries. We wish we could have stayed longer but we had an appointment with a fox… a Firefox. We made our way across town to the Toronto headquarters of Mozilla, the maker of Firefox. We wanted to visit Mozilla because when reading WCAG 2.0 you’ll find lots of references to user agents, which is the formal term for a web browser. WCAG 2.0 gives some responsibility to the web browser for making the web content usable by people with disabilities, although the heaviest responsibilities are detailed in WCAG’s sibling standard, the User Agent Accessibility Guidelines. In our discussion with a senior engineering manager, we learned more about the important albeit challenging responsibility that goes into developing a web browser. There is often a strong relationship between a browser and assistive technologies. A change in the browser could affect the way in which someone using an assistive technology is able to use web content. We felt a deep awareness that changes to the browser can have an impact on users that rely on the Firefox web browser, especially the impact on someone using an assistive technology. After a very technically focused meeting at Mozilla, we made our way to some more familiar territory. Our last stop was the University of Toronto, where we met with an AODA (Accessibility for Ontarians with Disabilities Act) Officer to discuss bringing accessibility to the forefront within large institutions. Many useful strategies came out of this discussion. For instance, ensuring that training is proactive rather than reactive; leveraging high-use communications channels to spread the word; and producing an AODA annual report to raise awareness. This visit was important to us as we ourselves work in large institutions and we recognize the value of being able to sustain informed and meaningful conversations about WCAG 2.0. So what else can we share about our field trip? There’s value in reading the official WCAG 2.0 documents closely. It guides us into areas of our communities that we might not have thought about. An accessible web is a large ecosystem, with many components that need to be aligned and working together in order for the ecosystem to thrive. Reaching out to groups working in these areas to listen to their perspectives is an invaluable way to learn about WCAG 2.0 and to imagine an accessible web where assistive technologies, web browsers and content producers work together. Aneta Kwak is the Accessibility and Public Services Librarian at D.G. Ivey Library, New College at the University of Toronto. She can be contacted at aneta.kwak [at] utoronto.ca. Mariana Jardim is a Liaison Librarian at the University of Toronto Scarborough Library. She can be contacted at mariana.jardim [at] utoronto.ca. Mark Weiler is a Web and User Experience Librarian at Wilfrid Laurier University. He can be contacted at mweiler [at] wlu.ca. Aneta, Mariana and Mark are members of the CAPAL Web Content Accessibility Guidelines (WCAG 2.0) Community of Practice.